MANILA, Philippines - European shares were mixed Thursday despite a second day of strong gains in Asia, where investors were encouraged by an uptick in China's trade and Singapore's surprise easing of monetary policy. Germany's DAX added 0.2 percent to 10,046.12. Britain's FTSE 100 was down 0.3 percent to 6,343.38. France's CAC 40 slid 0.2 percent to 4,480.18. U.S. futures augured subdued trading on Wall Street, with both Dow and S&P 500 futures virtually unchanged. Highly trade-dependent Singapore implemented an "zero percent appreciation" policy for its currency after economic growth was flat in the first quarter of the year. The step toward monetary easing suspended a policy of allowing the Singapore dollar to gradually appreciate. "There is an air of disbelief from all parts of the market. Many are having to remind themselves that the S&P 500 and Dow Jones are just 2.4 percent from taking out the 19 May 2015 all-time high," Chris Weston of IG said in a commentary. "Throw in an improving China picture and signs that monetary easing and fiscal policy are having an effect results in a daily chart that look like a breakout trader's dream on many markets." Japan's benchmark Nikkei 225 closed 3.2 percent higher at 16,911.05, as the yen slightly weakened against the dollar. Hong Kong's Hang Seng gained 0.9 percent to 21,337.81 while the Shanghai Composite index was up 0.5 percent at 3,082.36. Australia's S&P/ASX 200 rose 1.2 percent to 5,117.70. 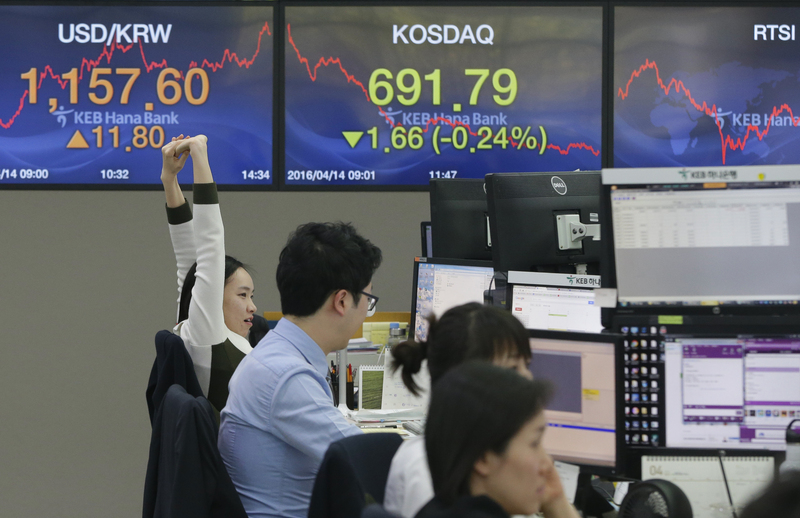 South Korea's KOSPI climbed 1.8 percent to 2,015.93. Southeast Asian markets were mixed, while markets in Thailand and India were closed for holidays. Benchmark U.S. crude oil fell 11 cents to $41.66 a barrel in electronic trading on the New York Mercantile Exchange. It lost 41 cents to $41.76 a barrel on Wednesday. Brent crude, the international standard, fell 13 cents to $44.05. The euro fell to $1.1259 from $1.1275 on Wednesday. The dollar fell to 109.21 from 109.43 yen.